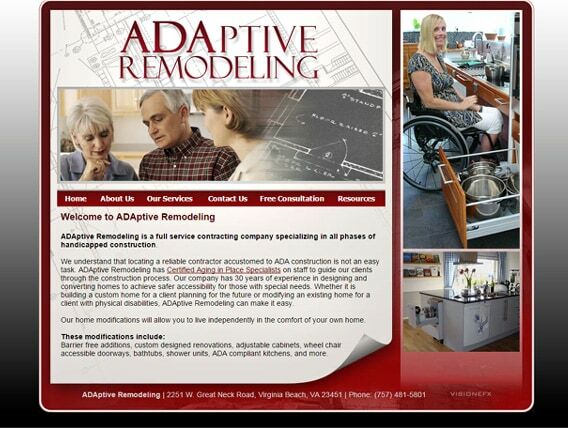 ADA Handicap Website design | Adaptive remodeling is part of the Virginia Beach Builder contracting business. Adaptive Remodeling asked VISIONEFX to design a website that reflect the scope and building expertise for ADA or handicap needs remodeling and building spaces. VISIONEFX continues to provide website maintenance to ADA to keep the website up and running 24/7. When searching Web Design Virginia Beach Website development VA look no further than VISIONEFX for all of your website needs. VISIONEFX is based in Virginia Beach, VA. We provide services small to medium businesses throughout the United States to include; custom web design, web development, eCommerce, SEO and web maintenance services. Call: (757) 619-6456 or email info@visionefx.net.